Your kitchen can be upgraded to a sommelier’s dream with a built-in black stainless steel refrigerator. 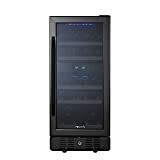 The sleek, modern look of black stainless complements nearly any decor, and a dedicated wine cooler cabinet keeps your beverages at the optimal temperature for pure enjoyment your collection. Whether you’re sipping alone or hosting a party, your wine will be ready to serve at the perfect temperature for optimal flavor. 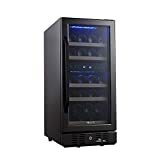 The NewAir AWR-290DB-B Compact 29-Bottle Compressor Wine Cooler in Black Stainless Steel Cooler has enough storage space for 29 bottles of wine, and adjustable shelves allow you to customize the space to accommodate large or standard bottles. 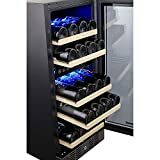 The clever design of this wine fridge optimizes interior storage capacity while keeping its footprint small — it's less than 15 inches wide and built to standard counter height and depth, so you’ll be able to incorporate it into any kitchen remodel or home wine cellar system. 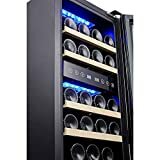 29 Bottle Capacity: Compact, 29 bottle storage, perfect for red and white wines. Cooling System: The dual zone compressor cooler allows you to set the temperature as low as 36 degrees Fahrenheit and as high as 72 degrees Fahrenheit. Digital Display: Quickly monitor and set temperatures in both temperature zones with ease using the push button controls just inside the door. 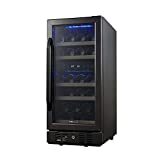 Interested in the NewAir AWR-290DB-B Compact 29 Bottle Built in Wine Cooler, Black Stainless Steel? Is the price too high? You can easily price watch this product and we'll notify you when the price reaches your target.